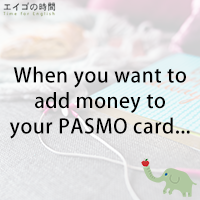 When you want to add money to your fare card, such as PASMO or SUICA, what do you do? You’d go to one of those ticket vending machines installed in subway or railway stations, right? I know those machines allow you to ‘charge’ your card. But in English, you don’t ‘charge’ your fare card to increase cash value on it. Instead, you ‘refill’ or ‘top-up’ your pay-as-you-go or prepaid card. For example, New Yorkers ‘refill’ their Metrocards, or in London, people ‘top-up’ their Oyster cards. You can also ‘reload’ or ‘recharge’ your card, or more simply, put money on your card or add money to your card. I’ll give you more example sentences using ‘refill’ and ‘top-up’ on the website. So please make sure to come visit us on Thursday. For now, I’ll give you a quiz. I’ll read three sentences. Please listen carefully and choose the one that is TRUE. Ready? 1. PASMO and SUICA are not fare cards. 2. When you refill your prepaid card, you’re adding money to that card. 3. New Yorkers can NOT top-up their Metrocards.